No one really needs an excuse to fly private to the Bahamas for a little R&R. They’re beautiful all year around, and vaunted as one of the most relaxing destinations on the planet. However, on the weekend of November 4th of this year, jet charter clients have a great excuse to book the trip. 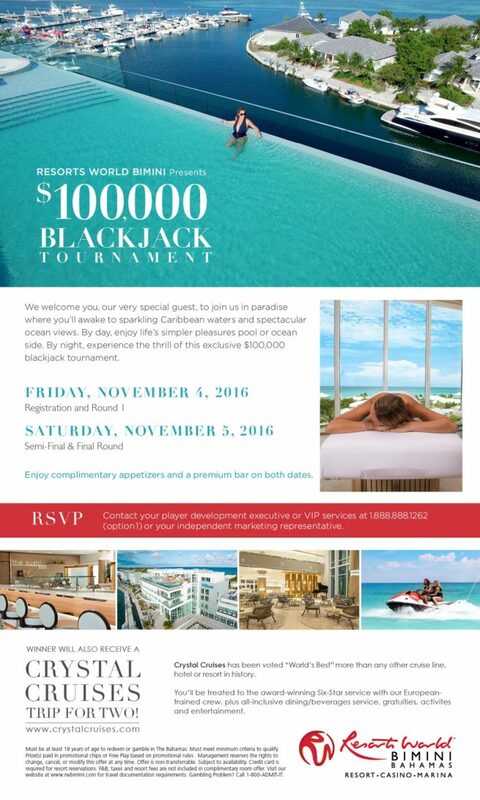 RW Bimini Bahamas Casino will be hosting one of the most sought after events in the islands – their $100,000 Black Jack Tournament. Enjoy the sparkling waters of the Caribbean while experiencing the exhilaration of competing with the card game’s most affluent enthusiasts; it’s set to be one heck of an experience. Aside from the impressive $100,000-dollar prize, the winner will also receive a Crystal Cruises trip for two. Voted “World’s Best” more than any cruise line, hotel, or resort in history, Crystal Cruises offers an all-inclusive Six-Star travel service that is unparalleled in the industry. Resorts World Bimini doesn’t just depend on the beauty of its surroundings to provide a good time, or the attractiveness of their prizes to entice visitors. The event will be offering complimentary gourmet appetizers and a premium bar on both days of the tournament, and a wealth of other on-site amenities to keep guests entertained. Having just opened the doors to their luxury Hilton Hotel, and boasting a bevy of generously-appointed villas, Resorts World Bimini has guests covered when it comes to lodging options. If all of this sounds a bit too good to pass up, Jet Charter Bahamas can make the offer absolutely irresistible. With our experience in the private flight industry, we can arrange private flights to The Bahamas with as little as 6 hours’ notice. If you’re planning on going to an exclusive event like this, it’s safe to assume that you’re used to the best of the best. Our boutique private aviation brokerage is accustomed to providing exactly that. Our list of distinguished clients ranges from heads of state to Fortune 500 CEOs – and everything in between. That means we know how important it is to get everything exactly the way the client expects it. Our transparent and hassle free booking service ensures that, come flight day, everything is in order and ready to go. Whether that includes in-flight Wi-Fi, gourmet catering, or a certain type of interior, clients can rest assured that it will all be ready. Clients need only step from their limo, to the tarmac, and then up the steps. From arriving to the airport to taking off, it can all happen in less than fifteen minutes. Whether you’re interested in taking the trip solo or with a group of friends, Jet Charter Bahamas can arrange the right aircraft to suit your needs. With access to thousands of aircraft in every part of the globe, it’s no problem to arrange everything from turbo props and heavy jets to helicopters and light jets. We can also arrange yacht charter from island to island upon request. We offer unlimited free quotes, so feel free to request a jet charter quote, or call 1-888-987-5387 to book your luxury private flight to The Bahamas.